Update period – you can choose update period from 1 hour to 1 month. The default setting is 1 day and that is the recommended optimal period for update of the data. If you choose shorter update period that may slow down your site, because calls to the social networks will be send more often. That consume loading resources and affect the speed of your site. Number format – choose how the number will be displayed at your Followers counter. Allow user values – turn on that option to set manual counter values. Social Networks – tick off the network you want to display at your Followers counter. You can rearrange the order with drag and drop. 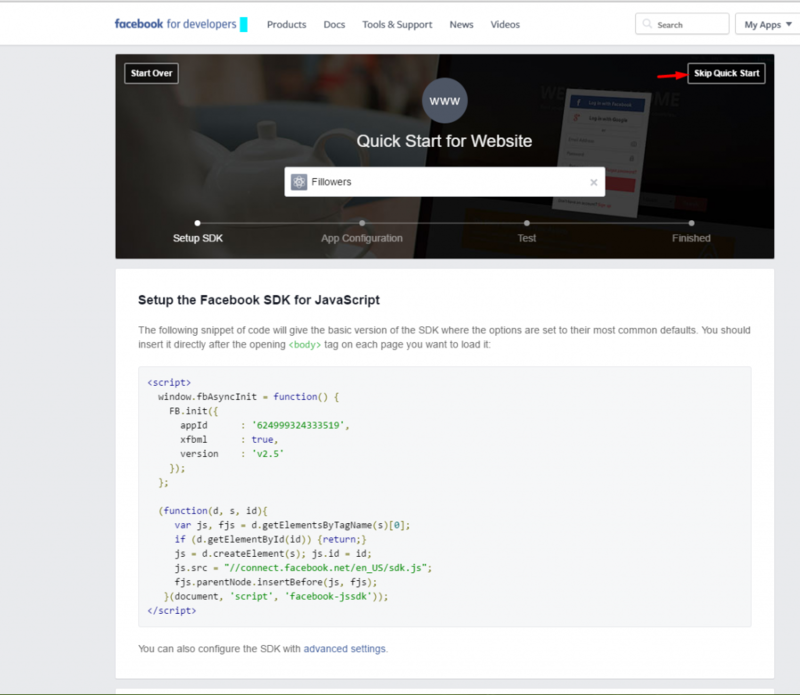 Page ID/Name or profile – paste here your Facebook page ID. 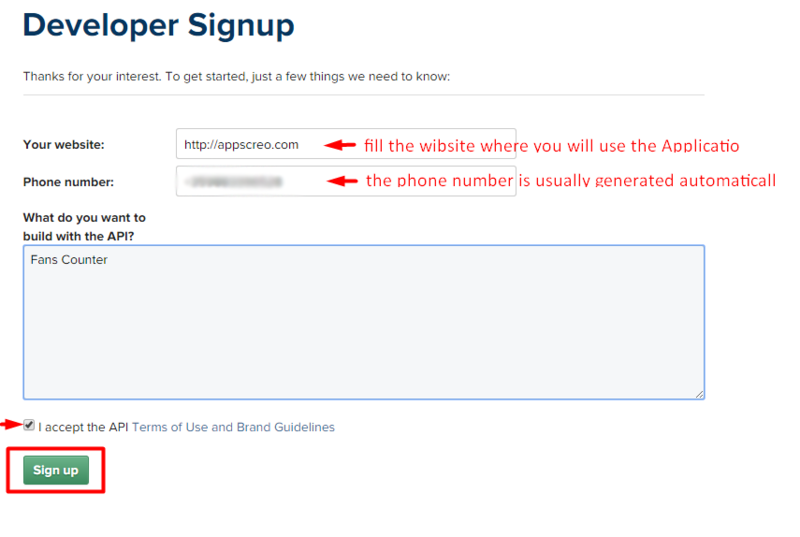 If your page link is something like http://www.facebook.com/pagename the page name will be pagename. If your page link is something like http://www.facebook.com/pages/pagename/12345678901234 the page ID will be 12345678901234. Account type – choose account type Page or Followers. Depends on your choice follow the instructions for generating token. 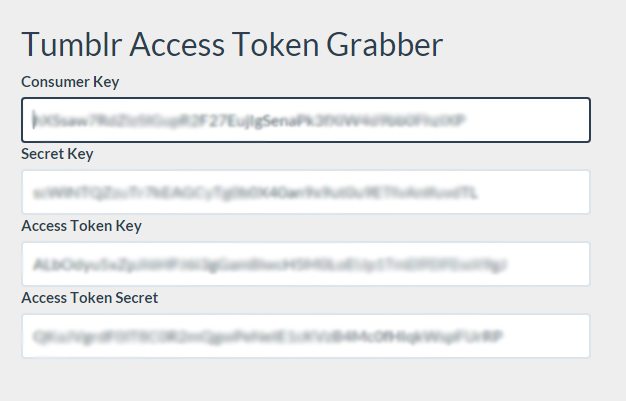 Access token – paste here your Access token. Pay attention for what account type you are going to generate token. 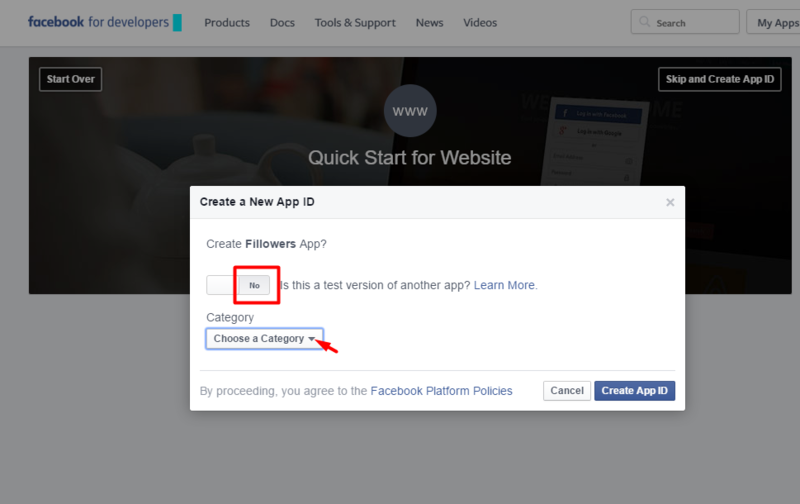 To get Page account type token you need to prepare Facebook App. 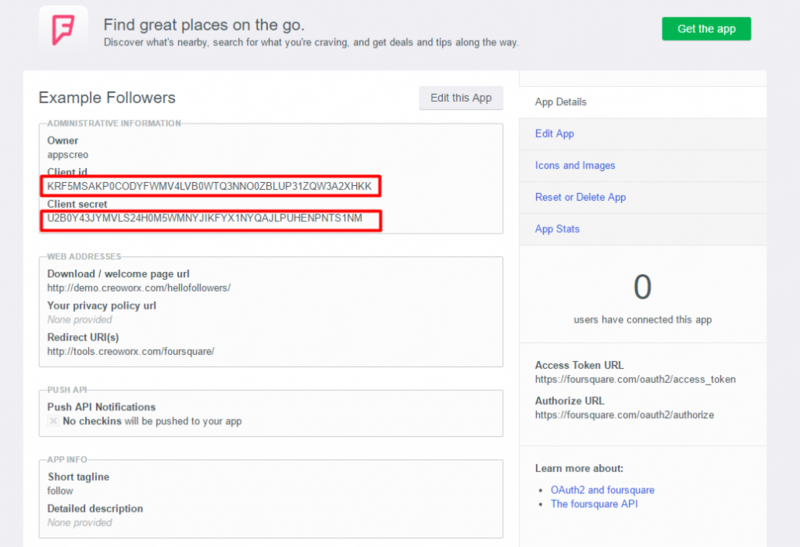 To generate Follow account type token you don’t need App. Just generate your token, following the instructions below. 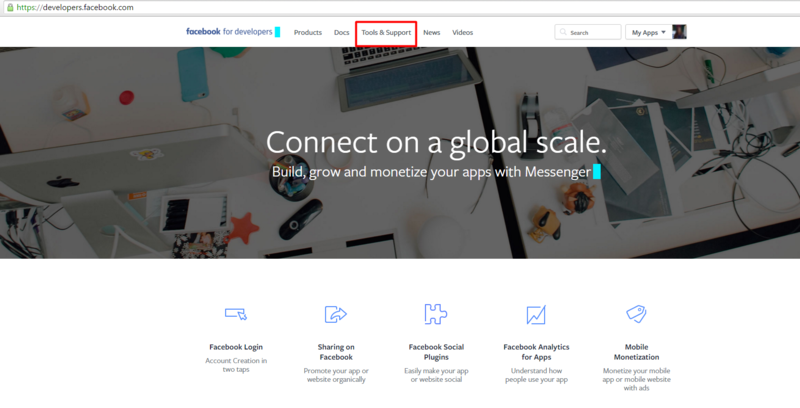 How to prepare Facebook App and generate Facebook Page Access token? 2. Click on My Apps tab from the menu and choose Add a new app from the drop down menu. 3. Choose Website from the pop up dialog box. 4. At Quick Start for Website that will load on your screen you have to fill in the name of the application that you are going to create. (The name will be visible only for you.) Press Create New Facebook App ID the button to confirm. 5. 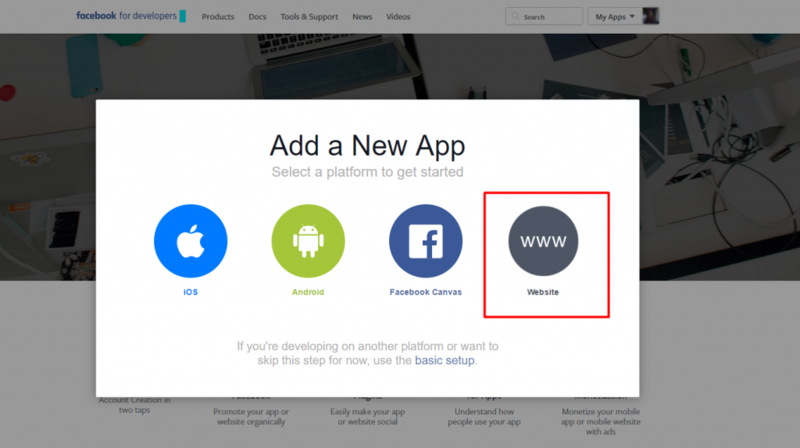 When you press Create New App ID button, a pop up dialog with the same name will load. For Is this a test version of another app? – set No. Then choose category for your app. 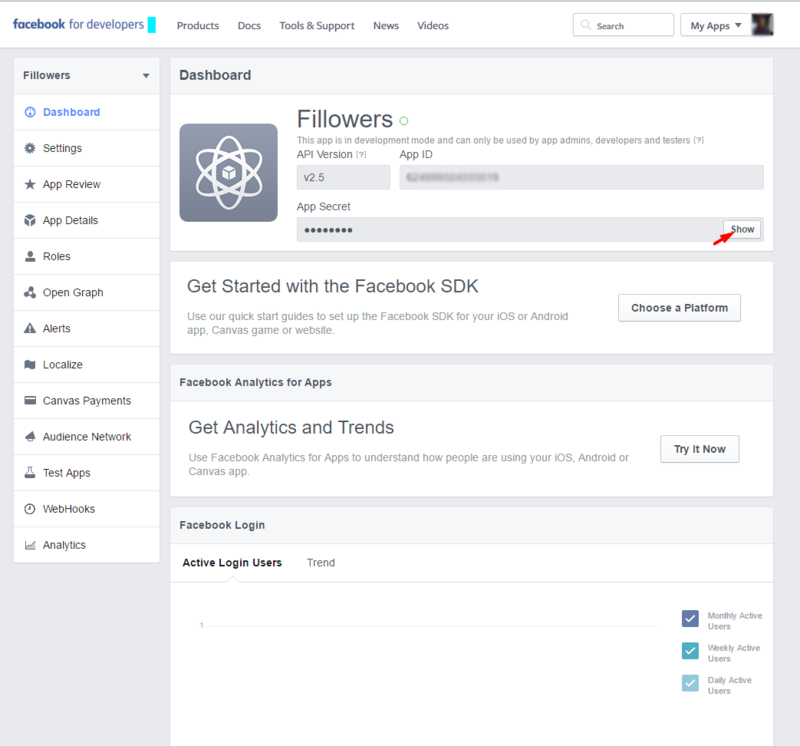 It’s recommended to find category as possible closer to the content of your fanpage. Press Create App ID button. 6. 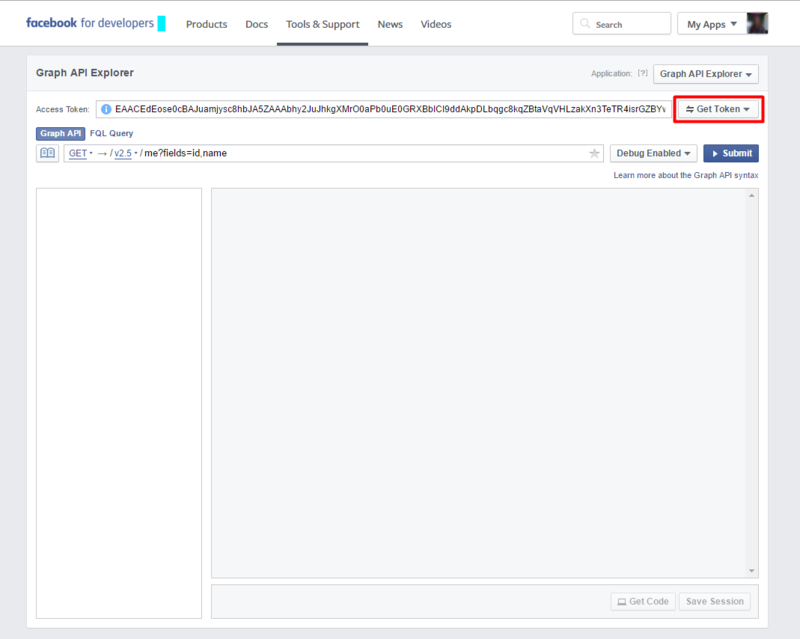 Quick Start for Facebook Website with the name of your application will load. Press Skip Quick Start. 7. You will get dashboard page for your App and settings navigation panel for it too. Make the App Secret visible – that will allow you to copy/paste it on the next setting step. 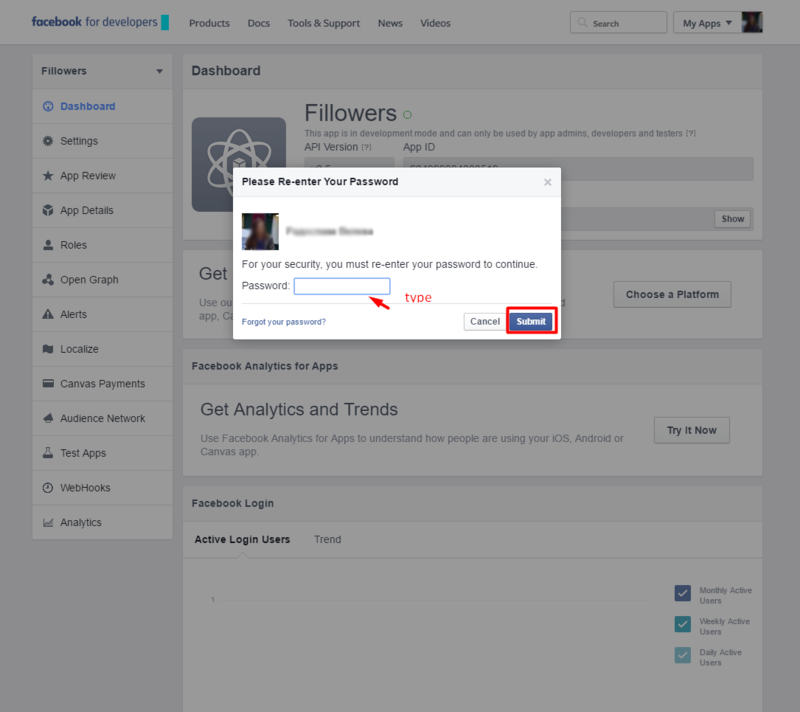 To make the secret visible you must re-enter your Facebook log-in password. 8. Go to http://tools.creoworx.com/fb/. 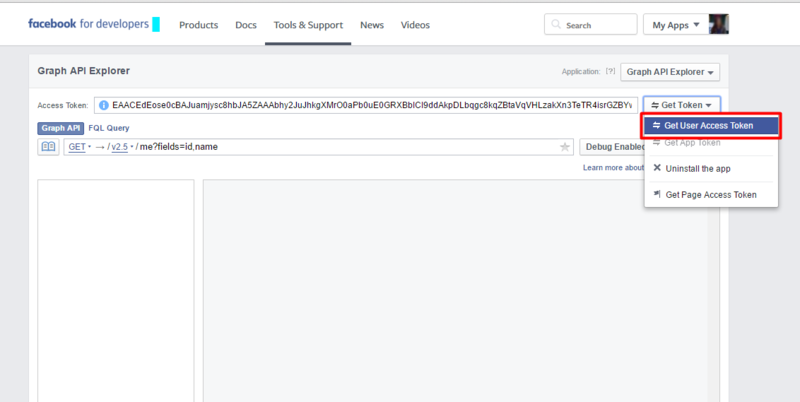 That URL will open Facebook Token Generator. 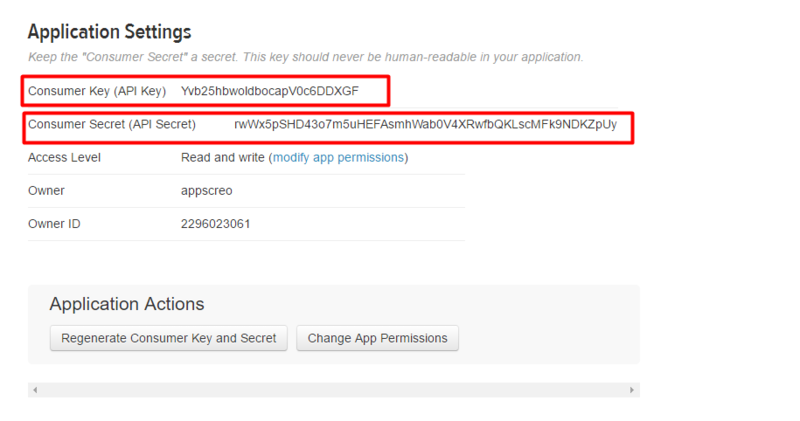 Copy your App ID and App Secret from the App Dashboard page and paste them at the Token Generator. Press Generate Access Token key button. That will load your Access Token Key. 9. Copy that key and paste it at the Access token field at the Hello Followers menu. 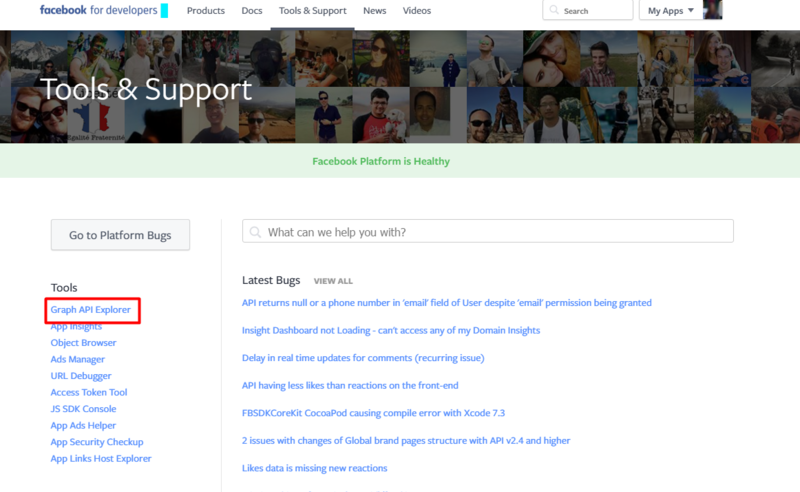 Click on Tools & Support tab from the menu and choose Grapg API Explorer from the sidebar menu. 2. 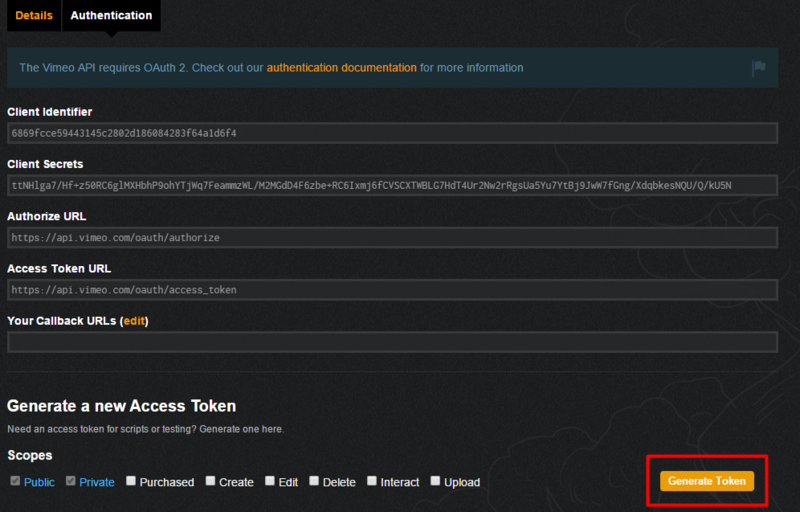 Press Get Token button -> Get Access Token -> and again Get Access Token. Then your token will display. Copy/paste it to Access token filed Hello Followers menu setting. Text below number – write the text you want to be visible under your Facebook Fololwers Counter number. The default text is Fans. The text can be customized in any language. Manual user value of followers – at this field you can set manually number of followers that will be displayed under Facebook Fans Counter icon. If that option is active (there is number set at the field), that number will not increase, until the real fans number is less than the manual set number. When the real fans number become more than the manual set number, the Fans counter will start count the real Likes/Follows. Username – tape here your username at Twitter without @ in front. Consumer key, Consumer secret, Access token, Access token secret – Follow the instructions below to fill that fields. How to create Twitter Application and get keys needed? 1. Go to https://dev.twitter.com/apps and press Create New App button. 2. At the Create an application window fill in the information required. 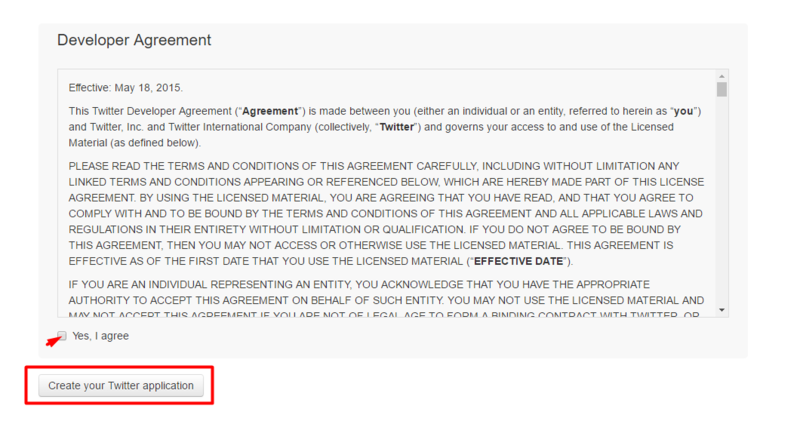 At the end of the page tick off Yes, I agree to confirm the Developer Agreement and press Create your Twitter application button. 3. Your Twitter application is ready. section and press Create my access token button. Under each of them you will find the keys you need. Copy/paste them at the Hello Followers menu setting fields. Text below number – write the text you want to be visible under your Twitter Followers Counter number. The default text is Followers. The text can be customized in any language. Manual user value of followers – at this field you can set manually number of followers that will be displayed under Twitter Fans Counter icon. If that option is active (there is number set at the field), that number will not increase, until the real fans number is less than the manual set number. When the real fans number become more than the manual set number, the Fans counter will start count the real Likes/Follows. Page ID/Name – paste here your G+ page ID or page name depends on the type of your page. 1. Go to https://console.developers.google.com/project and press Select a project button. 2. Write name for your project and press Create. 3. When the project is created, you will see your Project Dashboard. 4. 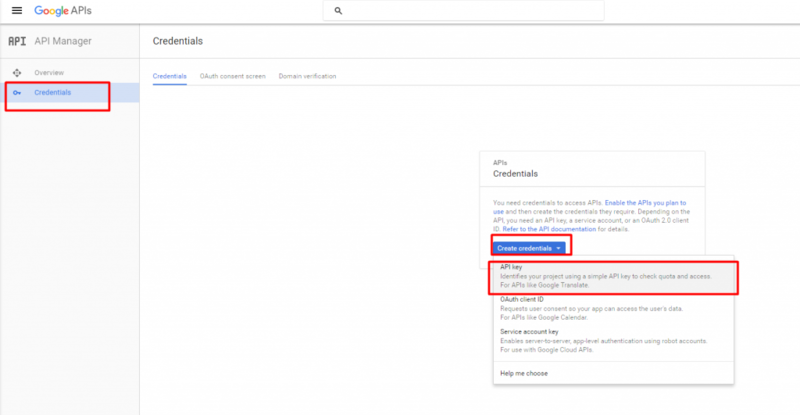 Press API’s, then Google+ API. 5. Press Enable API button. 6. Click on Credentials on the dashboard settings menu. 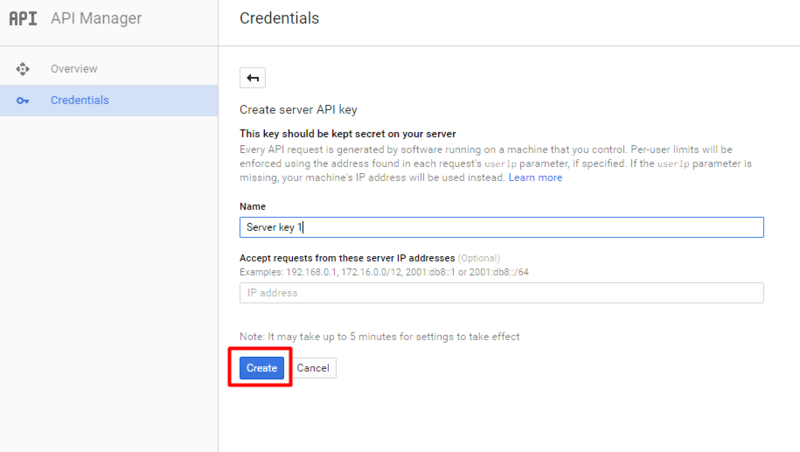 Then press Create Credentials button and choose API Key. 7. At the Create a new key pop up window pres Server key button. 8. At the new pop up window press Create button. 9. 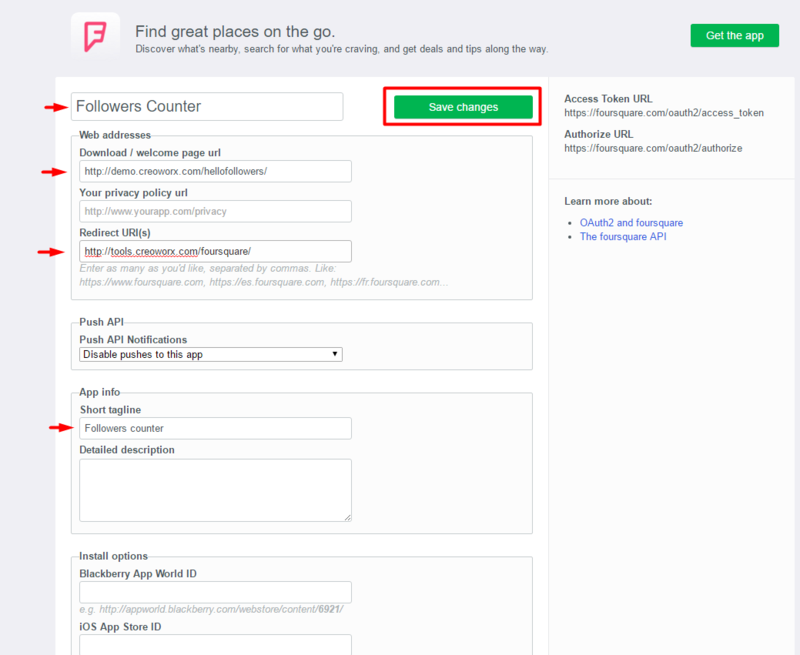 Copy the API key and paste it to the Hello Followers menu settings field. circledByCount+plusOneCount – counts +1 and add to circles both. plusOneCount – counts people that makes +1 to your page. circledByCount – counts only people that add you in their circles. Text below number – write the text you want to be visible under your G+ Fans Counter number. The default text is Fans. The text can be customized in any language. 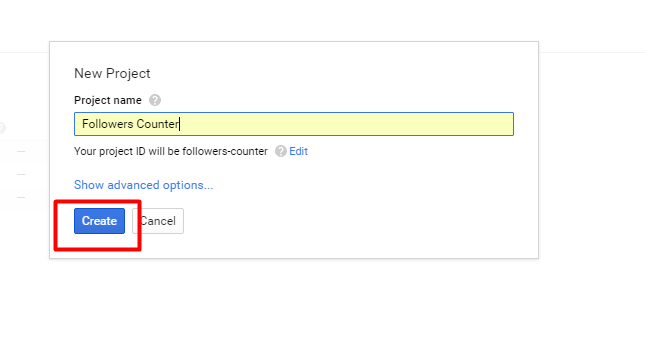 Manual user value of followers – set manually number of followers that will be displayed under G + Fans Counter icon. If that option is active (there is number set at the field), that number will not increase, until the real fans number is less than the manual set number. When the real fans number become more than the manual set number, the Fans counter will start count the real Fans/Follows. Username – paste here your Pinterest username. Fans text – write the text you want to be visible under your Pinterest Fans Counter number. The default text is Fans. The text can be customized in any language. Manual user value of followers – set manually number of followers that will be displayed under Pinterest Fans Counter icon. If that option is active (there is number set at the field), that number will not increase, until the real fans number is less than the manual set number. When the real fans number become more than the manual set number, the Fans counter will start count the real Likes/Follows. LinkedIn Company Page URL – paste here your full LinkedIn URL. 1. Click your Profile tab. 2. Copy the URL located at the grey dialog under your profile image. That is your Public Profile link. This is the address you need to use on your cards, forms, sites, etc. Text below number – write the text you want to be visible under your LinkedIn Fans Counter number. The default text is Followers. The text can be customized in any language. Manual user value of followers – set manually number of followers that will be displayed under LinkedIn Fans Counter icon. If that option is active (there is number set at the field), that number will not increase, until the real fans number is less than the manual set number. When the real fans number become more than the manual set number, the Fans counter will start count the real Followers/Follows. Username – paste here your GitHub username. Text below number – write the text you want to be visible under your GitHub Fans Counter number. The default text is Folowers. The text can be customized in any language. Manual user value of followers – set manually number of followers that will be displayed under GitHub Fans Counter icon. If that option is active (there is number set at the field), that number will not increase, until the real fans number is less than the manual set number. When the real fans number become more than the manual set number, the Fans counter will start count the real Followers/Follows. Channel name/Username – paste here your Channel name or username depends on the profile type you want to display as Fans Counter. Profile type – choose between channel or user. 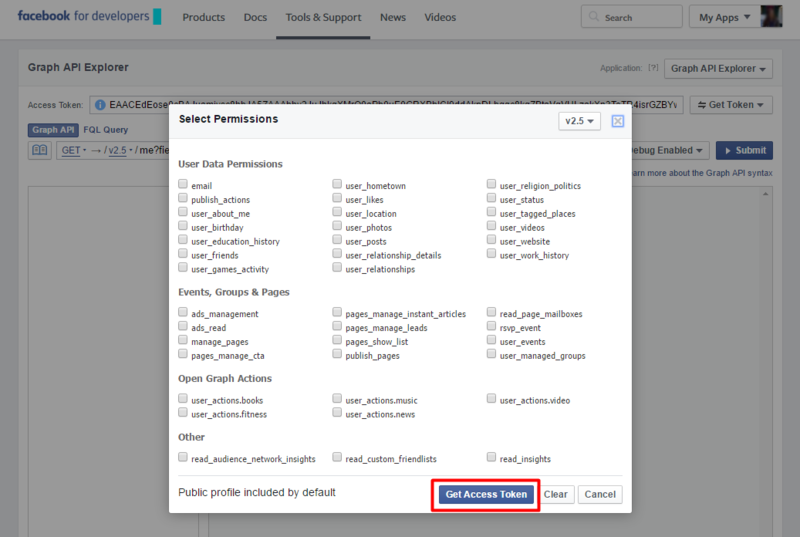 Access token – you need access token only if you want to display user profile type. 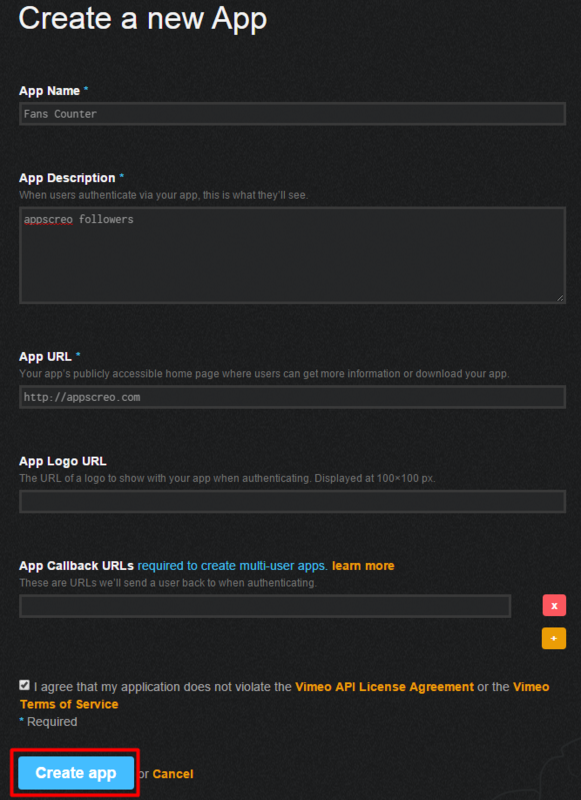 How to generate Vimeo Access Token? 1. 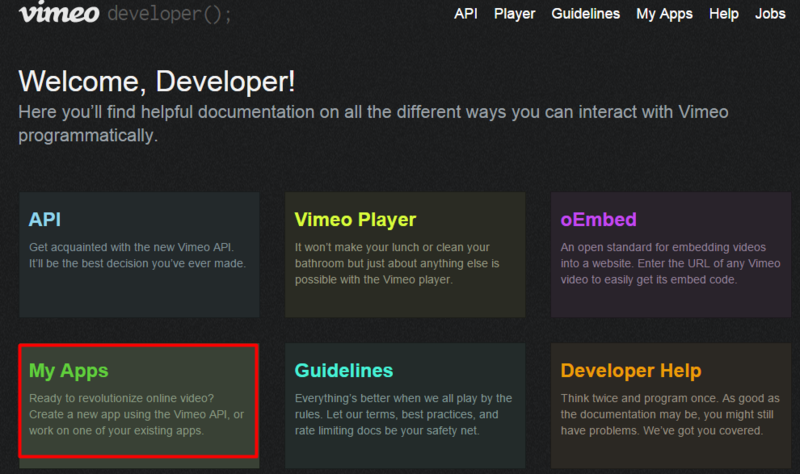 Log in at Vimeo and go to https://developer.vimeo.com and click on My Apps. 2. Press Create a new app button. 3. 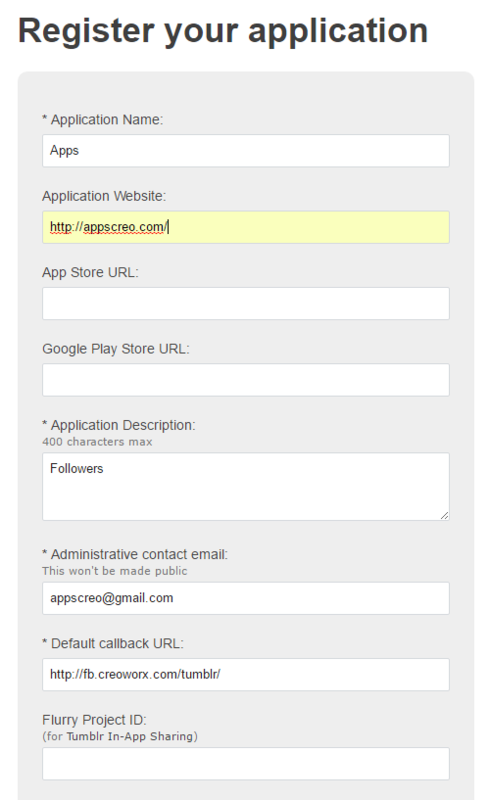 Fill the form with the details required and press Create app button. 6. Copy your token and paste it to ESSB menu settings field. Text below number – write the text you want to be visible under your Vimeo Fans Counter number. The default text is Subscribers. The text can be customized in any language. Manual user value of followers – set manually number of followers that will be displayed under Vimeo Fans Counter icon. If that option is active (there is number set at the field), that number will not increase, until the real fans number is less than the manual set number. When the real fans number become more than the manual set number, the Fans counter will start count the real Subscribers/Subscribes. Username – paste here your Dribbble username. Text below number – write the text you want to be visible under your Dribbble Fans Counter number. The default text is Followers. The text can be customized in any language. Manual user value of followers – set manually number of followers that will be displayed under Dribbble Fans Counter icon. If that option is active (there is number set at the field), that number will not increase, until the real fans number is less than the manual set number. When the real fans number become more than the manual set number, the Fans counter will start count the real Followers/Follows. Username – paste here your Envato username. Envato site – choose from the list Envato’s site, for which you want to display Followers Counter number. Referral username – write username that will receive a commission if attract new users. If that user is the same as the username filled in above, let this field empty. Text below number – write the text you want to be visible under your Envato Followers Counter number. The default text is Followers. The text can be customized in any language. 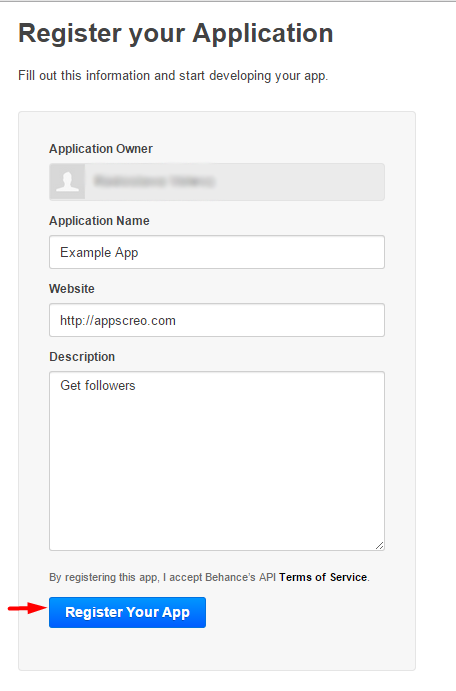 Manual user value of followers – set manually number of followers that will be displayed under Envato Fans Counter icon. If that option is active (there is number set at the field), that number will not increase, until the real fans number is less than the manual set number. When the real fans number become more than the manual set number, the Fans counter will start count the real Followers/Follows. Username – paste here your username. 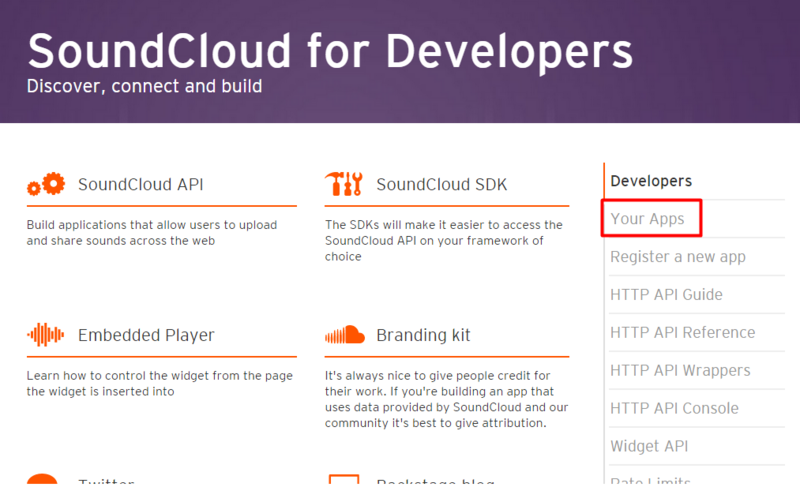 API Key – to use SoundCloud counter you need to create application. Go to application center and create a new application. Then paste here the API Key of your application. How to prepare SoundCloud API Key? 1. Log in to your account and open the SoundCloud profile menu. Click on Developers, then choose Your Apps. 2. Click on Register a new application button. 3. 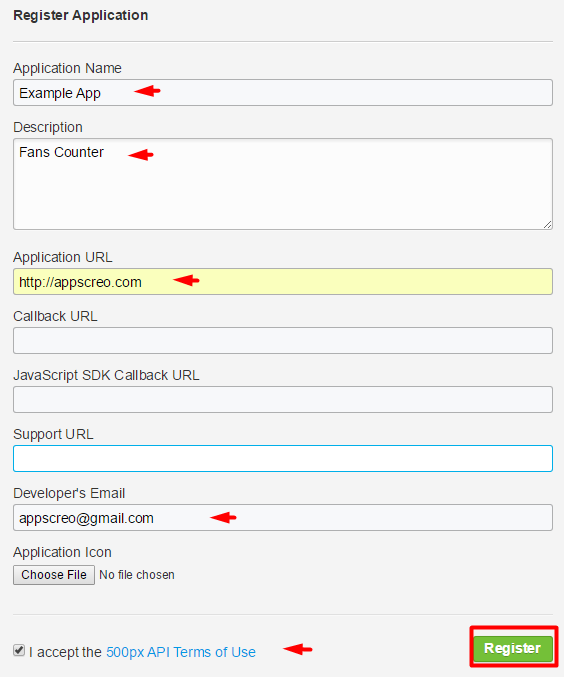 Write name for your application, accept the Developer Policies and click Register. 4. At Website of your app and Redirect URL for Authentication fill in the site, where the Fans Counter will be used, and click Save app. Copy your Client Secret and paste it to the Hello Followers menu settings field. Text below number – write the text you want to be visible under your SoundCloud Followers Counter number. The default text is Followers. The text can be customized in any language. Manual user value of followers – set manually number of followers that will be displayed under SoundCloud Followers Counter icon. If that option is active (there is number set at the field), that number will not increase, until the real fans number is less than the manual set number. When the real fans number become more than the manual set number, the Followers counter will start count the real Followers/Follows. API Key – to use Behance counter you need to create application. How to prepare Behance API? 1. Go to https://www.behance.net/ and at the left down corner press on More Behance. That will display a little menu. Press at Behance API on it. 2. Click on Register your App button. 3. 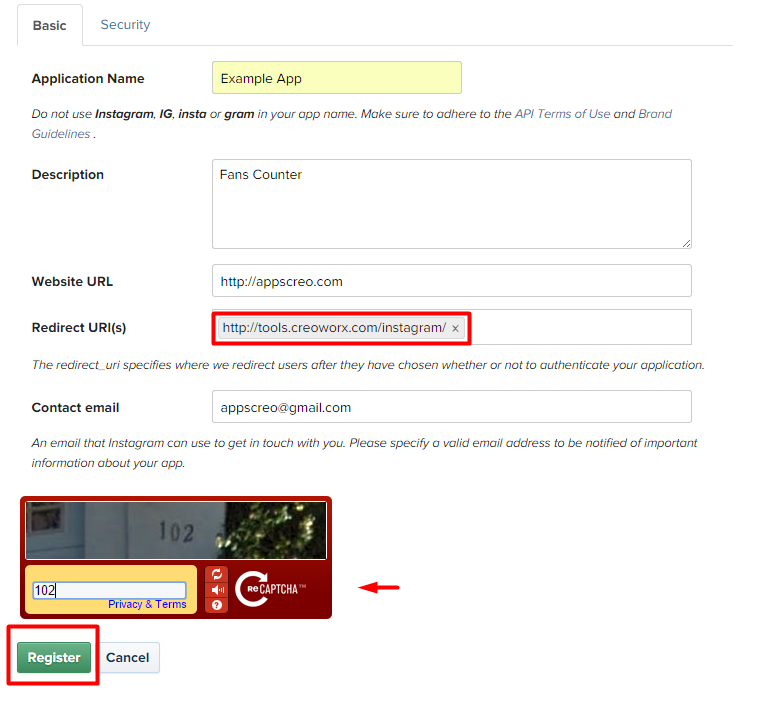 Fill the information required and press Register Your App button. 4. 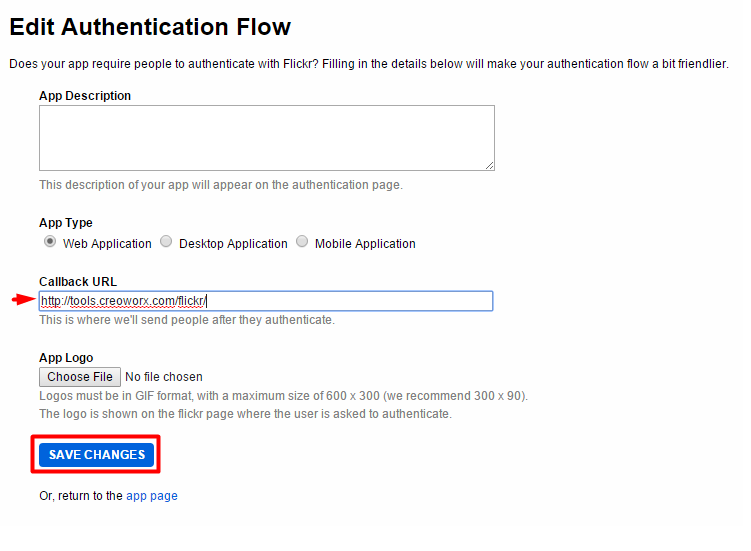 Copy the API KEY / CLIENT ID and paste it to the Follower Settings menu settings field. Text below number – write the text you want to be visible under your Behance Followers Counter number. The default text is Followers. The text can be customized in any language. Manual user value of followers – set manually number of followers that will be displayed under Behance Followers Counter icon. If that option is active (there is number set at the field), that number will not increase, until the real fans number is less than the manual set number. When the real fans number become more than the manual set number, the Followers counter will start count the real Followers/Follows. Choose List – when there is MailPoet plugin installed at the drop down menu you will see list with all your mail lists, created at the MailPoet. You can choose to display at the Followers counter the subscribers for particular list. If you choose Total Subscribers, the Followers counter will display summed number of all subscribers from all your lists. List URL – paste here the URL of the list you have set at the option above. Find the URL at MailPoet settings, next to each list. If you have chosen Total Subscribers let the field empty. Text below number – write the text you want to be visible under your MailPoet Followers Counter number. The default text is Subscribers. The text can be customized in any language. Manual user value of followers – at this field you can set manually number of followers that will be displayed under Steam Followers Counter icon. If that option is active (there is number set at the field), that number will not increase, until the real fans number is less than the manual set number. When the real fans number become more than the manual set number, the Followers counter will start count the real Subscribers. URL address when user click on love button – write here URL that will be loved. Text below number – write the text you want to be visible under your Love Fans Counter number. The default text is Loves. The text can be customized in any language. Manual user value of followers – at this field you can set manually number of followers that will be displayed under Love Followers Counter icon. If that option is active (there is number set at the field), that number will not increase, until the real fans number is less than the manual set number. When the real fans number become more than the manual set number, the Followers counter will start count the real Loves. Text below number – write the text you want to be visible under your Feedly Fans Counter number. The default text is Subscribers. The text can be customized in any language. Manual user value of followers – at this field you can set manually number of followers that will be displayed under Feedly Followers Counter icon. If that option is active (there is number set at the field), that number will not increase, until the real fans number is less than the manual set number. When the real fans number become more than the manual set number, the Followerscounter will start count the real Subscribers/Subscribe. Username – write here your username. Text below number – write the text you want to be visible under your WeHeartit Fans Counter number. The default text is Followers. The text can be customized in any language. Manual user value of followers – at this field you can set manually number of followers that will be displayed under WeHeartit Followers Counter icon. If that option is active (there is number set at the field), that number will not increase, until the real fans number is less than the manual set number. When the real fans number become more than the manual set number, the Followers counter will start count the real Follow/Followers. Social network profile ID – write here your username. Text below number – write the text you want to be visible under your Steam Fans Counter number. The default text is Members. The text can be customized in any language. Manual user value of followers – at this field you can set manually number of followers that will be displayed under Steam Followers Counter icon. If that option is active (there is number set at the field), that number will not increase, until the real fans number is less than the manual set number. When the real fans number become more than the manual set number, the Followers counter will start count the real Members/Join. Text below number – write the text you want to be visible under your WordPress Users Followers Counter number. The default text is Subscribers. The text can be customized in any language. Manual user value of followers – at this field you can set manually number of followers that will be displayed under WordPress Posts Followers Counter icon. If that option is active (there is number set at the field), that number will not increase, until the real fans number is less than the manual set number. When the real fans number become more than the manual set number, the Followers counter will start count the real Posts. Text below number – write the text you want to be visible under your WordPress Comments Followers Counter number. The default text is Comments. The text can be customized in any language. Text below number – write the text you want to be visible under your WordPress Posts Followers Counter number. The default text is Posts. The text can be customized in any language. Manual user value of followers – at this field you can set manually number of followers that will be displayed under WordPress Posts FollowersCounter icon. If that option is active (there is number set at the field), that number will not increase, until the real fans number is less than the manual set number. When the real fans number become more than the manual set number, the Followers counter will start count the real Posts. 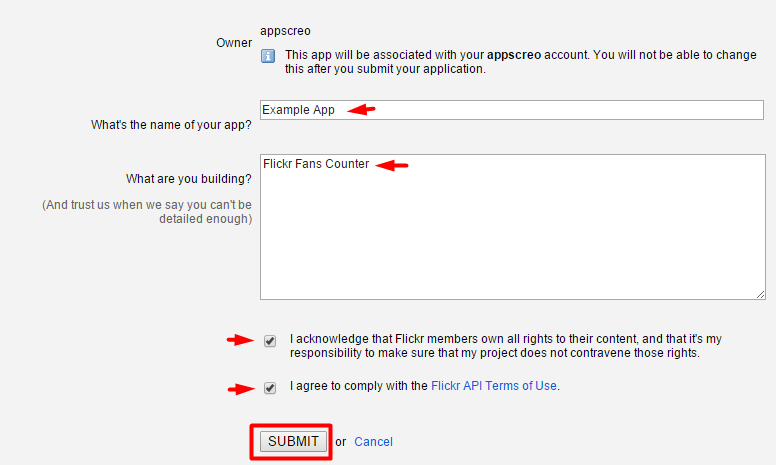 How to get my Flickr API key? 1. 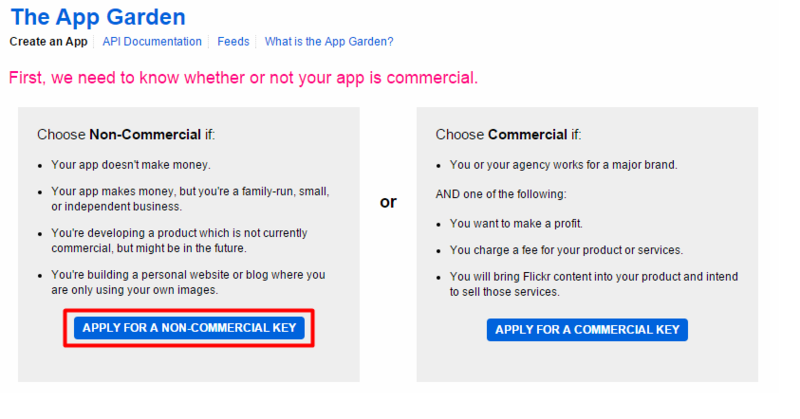 Go to Flickr App Garden (you need to be logged into your Yahoo account) and click on the non-commercial key button. 2. Fill the information required and press Submit. 3. Press on Edit the authentication flow. 4. Paste http://tools.creoworx.com/flickr/ at the Callback URL field. Press Save Changes. 5. 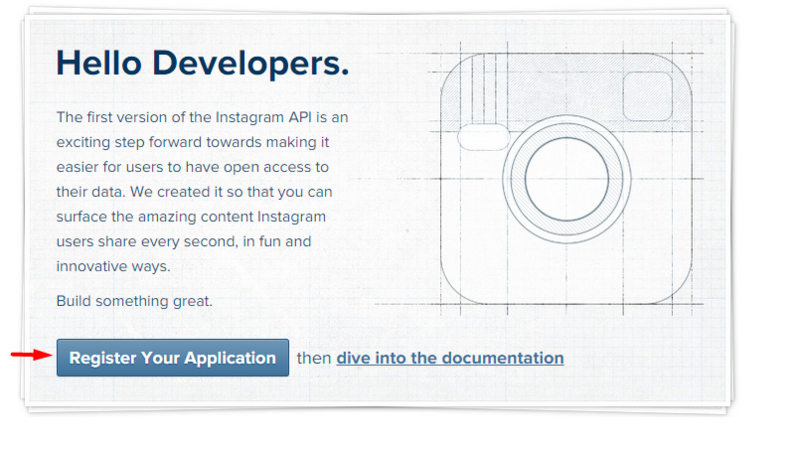 Press View the API Key for this app. 6. 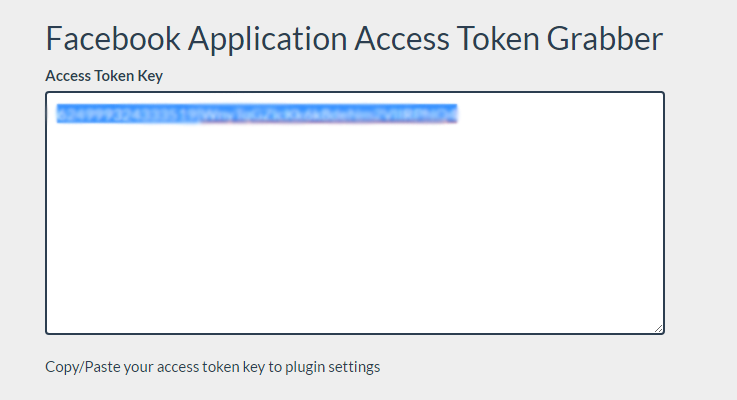 Go to Flickr Access Token Grabber and paste your Application Key and Application Secret. 7. Here is your API Key. Copy/Paste it at Hello Followers menu settings field. Text below number – write the text you want to be visible under your Flickr Followers Counter number. The default text is Followers. The text can be customized in any language. Manual user value of followers – at this field you can set manually number of followers that will be displayed under Flickr Followers Counter icon. If that option is active (there is number set at the field), that number will not increase, until the real fans number is less than the manual set number. When the real fans number become more than the manual set number, the Followers counter will start count the real Followers/Follows. Username – write here your username. 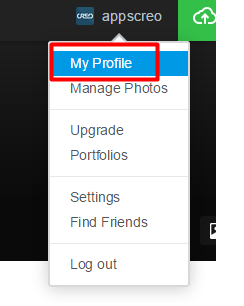 To find your username log into your account and click on My profile. Then look at the browser bar – https://500px.com/yourusername. 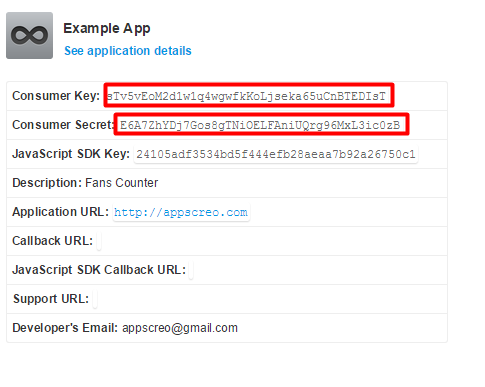 How to get my 500px API Key and API Secret? 1. Go to https://500px.com/settings/applications and click on Register your application button. 2. Fill the Register Application form and press Register. 3. When you see your Application Tab, press on See application details and you will see your keys. Copy/paste them at Hello Followers settings menu fields. 4. When you see your Application Tab, press on See application details and you will see your keys. Copy/paste them at Hello Followers settings menu fields. Text below number – write the text you want to be visible under your 500px Followers Counter number. The default text is Followers. The text can be customized in any language. Manual user value of followers – at this field you can set manually number of followers that will be displayed under 500px Followers Counter icon. If that option is active (there is number set at the field), that number will not increase, until the real fans number is less than the manual set number. When the real fans number become more than the manual set number, the Followers counter will start count the real Likes/Follows. Choose List – when there is myMail plugin installed at the drop down menu you will see list with all your mail lists, created at the myMail. You can choose to display at the Followers counter the subscribers for particular list. If you choose Total Subscribers, the Followers counter will display summed number of all subscribers from all your lists. List URL – paste here the URL of the list you have set at the option above. Find the URL at myMail settings, next to each list. If you have chosen Total Subscribers let the field empty. Spotify URL – log into your acount at https://play.spotify.com/user. Click on the dots under your profile name and picture and press Copy Spotify URL. Then paste it at that field. Text below number – write the text you want to be visible under your Spotify Followers Counter number. The default text is Followers. The text can be customized in any language. Manual user value of followers – at this field you can set manually number of followers that will be displayed under Spotify Followers Counter icon. If that option is active (there is number set at the field), that number will not increase, until the real fans number is less than the manual set number. When the real fans number become more than the manual set number, the Followers counter will start count the real Followers. URL address when user click on total button – write here the URL of the site, where Followers Counter is displayed. Text below number – write the text you want to be visible under your Total Followers Counter number. The default text is Fans Love us. The text can be customized in any language. Text below number – write the text you want to be visible under your Twitch Followers Counter number. The default text is Followers. The text can be customized in any language. Manual user value of followers – at this field you can set manually number of followers that will be displayed under Steam Followers Counter icon. If that option is active (there is number set at the field), that number will not increase, until the real fans number is less than the manual set number. When the real fans number become more than the manual set number, the Followers counter will start count the real Followers. Text below number – write the text you want to be visible under your SlideShare Fans Counter number. The default text is Followers. The text can be customized in any language. Manual user value of followers – at this field you can set manually number of followers that will be displayed under SlideShare Followers Counter icon. If that option is active (there is number set at the field), that number will not increase, until the real fans number is less than the manual set number. When the real fans number become more than the manual set number, the Follwers counter will start count the real Likes/Follows. Blog basename – write here your Tumblr username. Consumer Key – to get your Consumer Key please follow the steps below. How to get my Tumblr Consumer Key? 1. 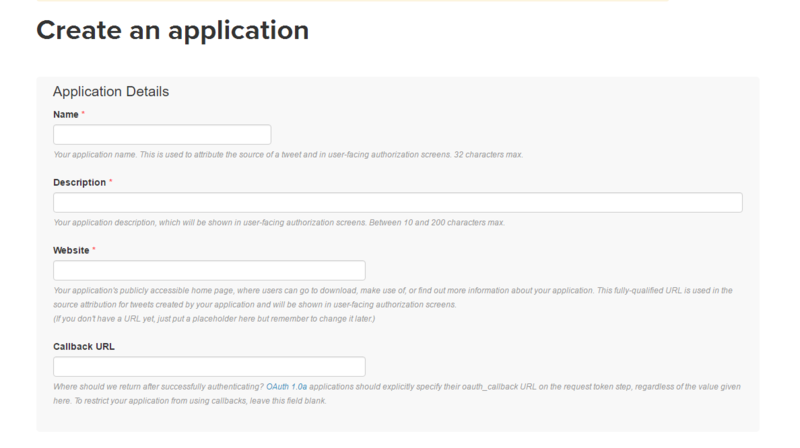 Go to http://www.tumblr.com/oauth/register, fill the form and press Register button. 2. At the applications list find the tab of the application you have just created and press Show secret key and you will see your secret key. 3. 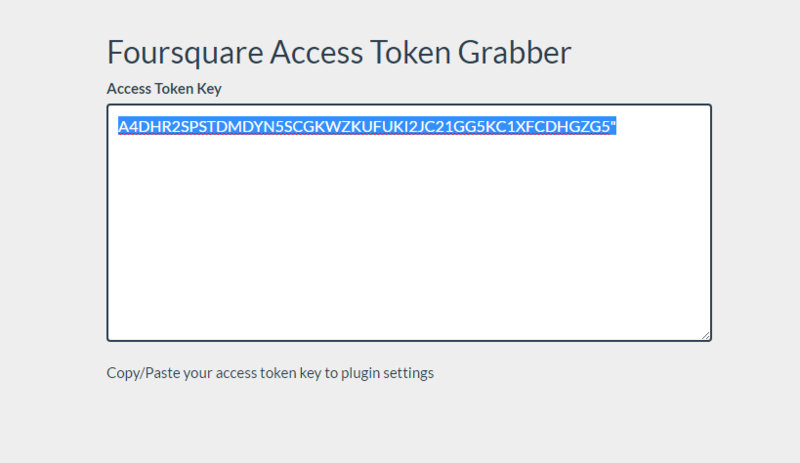 Open our Tumblr Access Token Grabber, paste the your keys at the respective fields and press Get Access Keys button. 4. Give your permission the application you have just created to be connected with your account by pressing Allow. 5. And you will get list with all the keys you need to set your Tumblr Fans counter. Copy/paste them at the Hello Followers menu settings fields. Text below number – write the text you want to be visible under your Tumblr Fans Counter number. The default text is Followers. The text can be customized in any language. Manual user value of followers – at this field you can set manually number of followers that will be displayed under Tumblr Followers Counter icon. If that option is active (there is number set at the field), that number will not increase, until the real fans number is less than the manual set number. When the real fans number become more than the manual set number, the Followers counter will start count the real Followers/Follows. Text below number – write the text you want to be visible under your Audioboo Fans Counter number. The default text is Followers. The text can be customized in any language. Email – write the e-mail you have used for your Vine account. Password – write the password for your Vine account. 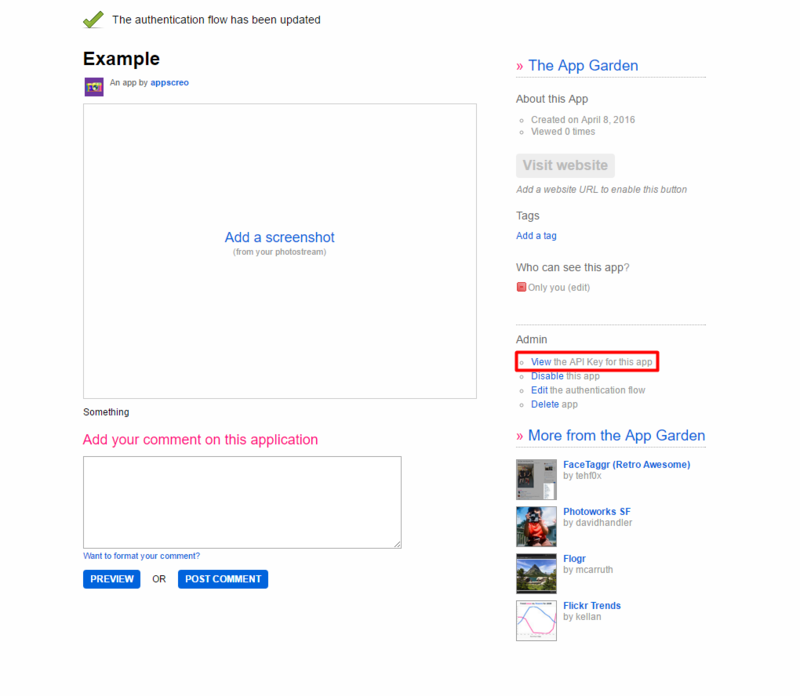 Username – write the username of your Vine account. Text below number – write the text you want to be visible under your Vine Fans Counter number. The default text is Followers. The text can be customized in any language. Manual user value of followers – at this field you can set manually number of followers that will be displayed under Vine Followers Counter icon. If that option is active (there is number set at the field), that number will not increase, until the real fans number is less than the manual set number. When the real fans number become more than the manual set number, the Followers counter will start count the real Followers/Follows. URL address of your feed – paste here the URL of the feed. Value of subscribers – at RSS there is no possibility for automatically Followers Counter set. It is needed to set manually the count number. You will periodically need to update the value number manually from that field. Text below number – write the text you want to be visible under your RSS Fans Counter number. The default text is Subscribers. The text can be customized in any language. Your VK.com ID number – you can see your ID number at the URL, when you are logged in at your VK account. The ID is only numbers. Profile type – choose the type of your ocount you want to diaplsy at Followers Counter. Text below number – write the text you want to be visible under your VK Fans Counter number. The default text is Followers. The text can be customized in any language. Manual user value of followers – at this field you can set manually number of followers that will be displayed under VK Followers Counter icon. If that option is active (there is number set at the field), that number will not increase, until the real fans number is less than the manual set number. When the real fans number become more than the manual set number, the Followers counter will start count the real Likes/Follows. Channel/User – fill in your channel name or your user depends on the account type you want to display at your Fans Counter. Text below number – write the text you want to be visible under your YouTube Fans Counter number. The default text is Subscribers. The text can be customized in any language. Account Type – choose the account type. 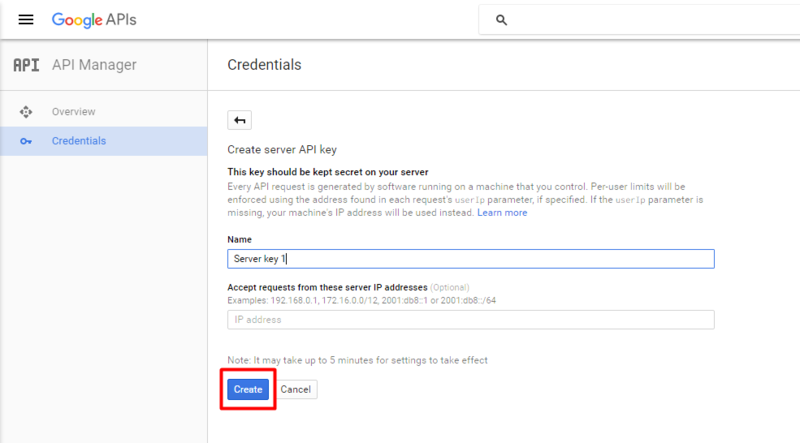 API Key – to get your API Key please follow the instructions. How to generate my YouTube API Key? 1. Go to Google Developers Conscole and press Create Project button. 2. Choose name for your project and press Create button. 3. 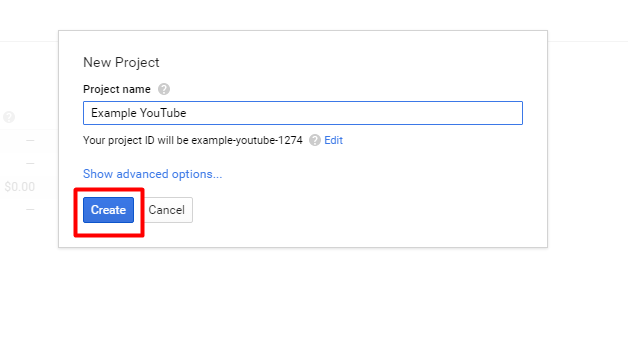 Wait for a while and Overview Page will load and press on YouTube Data API. 4. Press Enable API button. 5. Press on Credentials at left hand side. 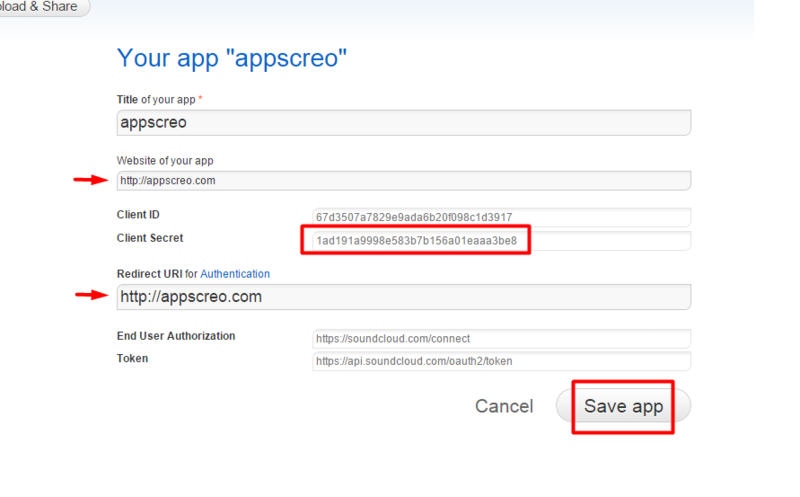 That will pop-up APIs Credentials dialog. Press Credentials button. Then choose API Key. 6. At the window, that will pop up, choose Server key. Then press Create at the next pop up. 7. Copy the key and paste it at the Hello Followers menu settings field. Manual user value of followers – at this field you can set manually number of followers that will be displayed under YouTube Followers Counter icon. If that option is active (there is number set at the field), that number will not increase, until the real followers number is less than the manual set number. When the real followers number become more than the manual set number, the Followers counter will start count the real Subscribe/Subscribers. User ID – to get your ID look bellow the instructions for generating access token key. When you get your key, you will see your User ID too. 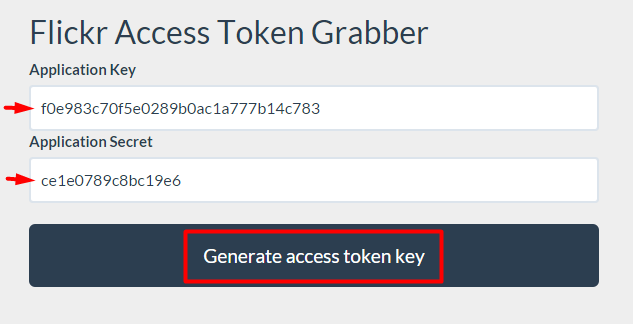 Access Token – to generate your token follow the steps below. 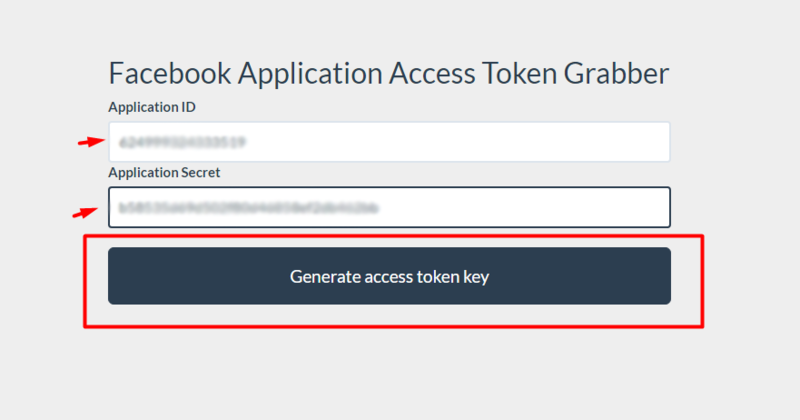 How to generate my Instagram Access Token? 1. Go to https://instagram.com/developer/ and click on Register Your Application button. 2. Fill in the Developer Signup form. 3. Look at the Getting Started section and press on the first step Register. 4. Click Register a New Client button. 5. Fill the Register new Client ID form. 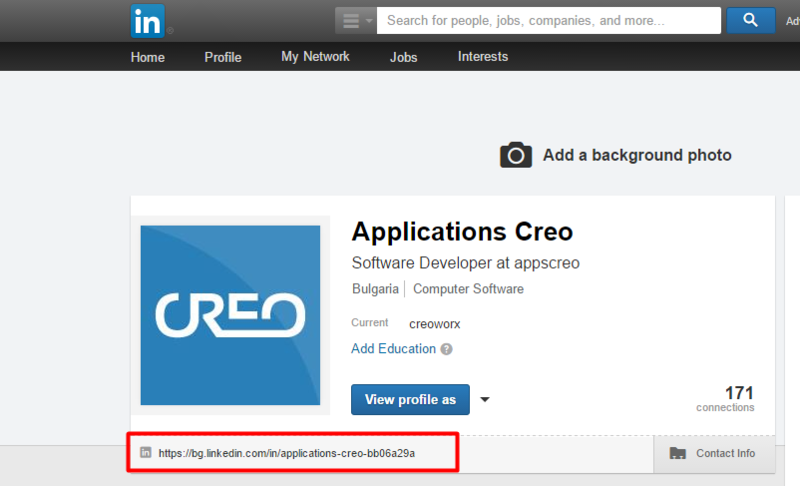 At Redirect URL(s) field paste that address http://tools.creoworx.com/instagram/. 6. 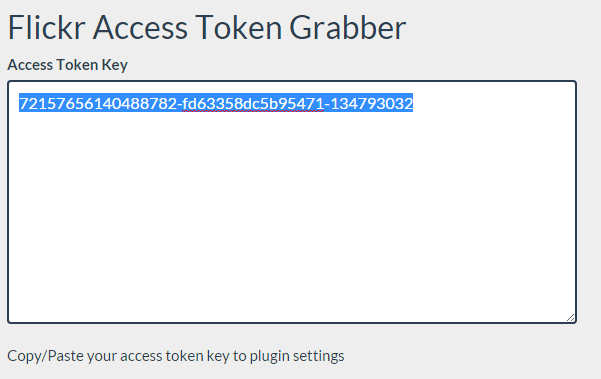 Then open our Instagram Access Token Grabber and press the button Generate access token key. That will generate your token. Just copy the key and paste it at your Hello Followers settings menu field. Text below number – write the text you want to be visible under your Instagram Followers Counter number. The default text is Followers. The text can be customized in any language. Manual user value of followers – at this field you can set manually number of followers that will be displayed under Instagram Followers Counter icon. If that option is active (there is number set at the field), that number will not increase, until the real fans number is less than the manual set number. When the real followers number become more than the manual set number, the Followers counter will start count the real Follow/Followers. Text below number – write the text you want to be visible under your Delicious Followers Counter number. The default text is Followers. The text can be customized in any language. Manual user value of followers – at this field you can set manually number of followers that will be displayed under Delicious Followers Counter icon. If that option is active (there is number set at the field), that number will not increase, until the real followers number is less than the manual set number. When the real followers number become more than the manual set number, the Followers counter will start count the real Follow/Followers. 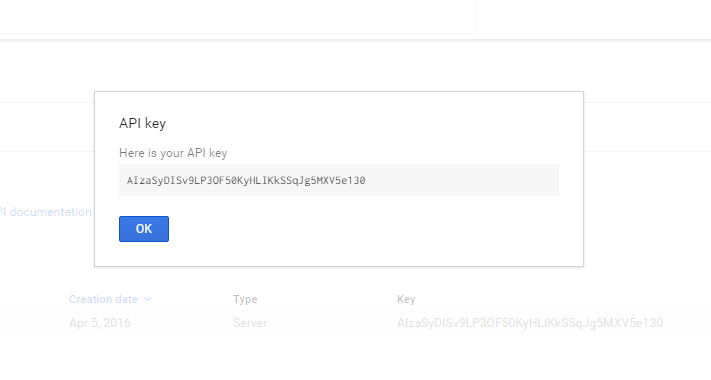 API Key – to find your API Key http://kb.mailchimp.com/accounts/management/about-api-keys. Text below number – write the text you want to be visible under your MailChimp Fans Counter number. The default text is Subscribers. The text can be customized in any language. List URL address – go to that address to share sign up form with your fans and customers – http://kb.mailchimp.com/lists/signup-forms/share-your-signup-form. That will help you to get more subscribers to your mail lists. Manual user value of followers – at this field you can set manually number of followers that will be displayed under MailChimp Followers Counter icon. If that option is active (there is number set at the field), that number will not increase, until the real followers number is less than the manual set number. When the real followers number become more than the manual set number, the Followers counter will start count the real Subscribe/Subscribers. Username – fill in your username. Text below number – write the text you want to be visible under your Forrst Followers Counter number. The default text is Followers. The text can be customized in any language. Manual user value of followers – at this field you can set manually number of followers that will be displayed under Forrst Followers Counter icon. If that option is active (there is number set at the field), that number will not increase, until the real fans number is less than the manual set number. When the real fans number become more than the manual set number, the Followers counter will start count the real Likes/Follows. 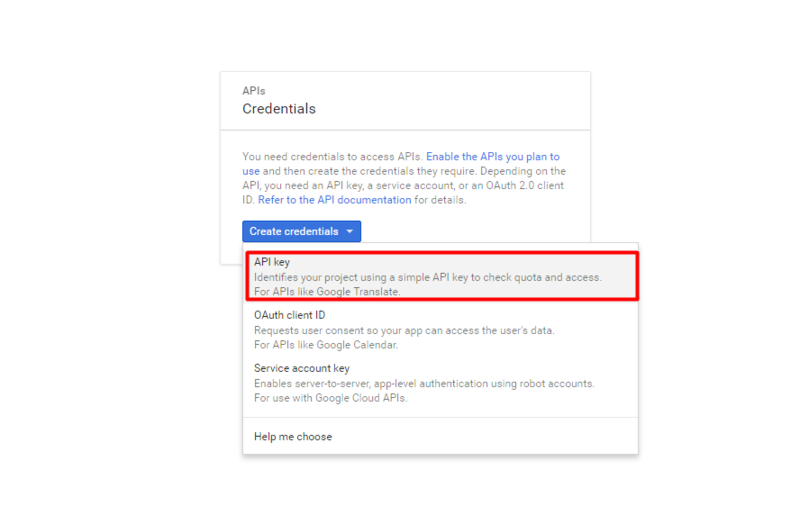 API Key – follow the instructions below to generate your API Key and paste it at this field. 1. Log in to your Foursquare account and go to https://foursquare.com/developers/register. Fill in the form as it is shown at the example. 2. 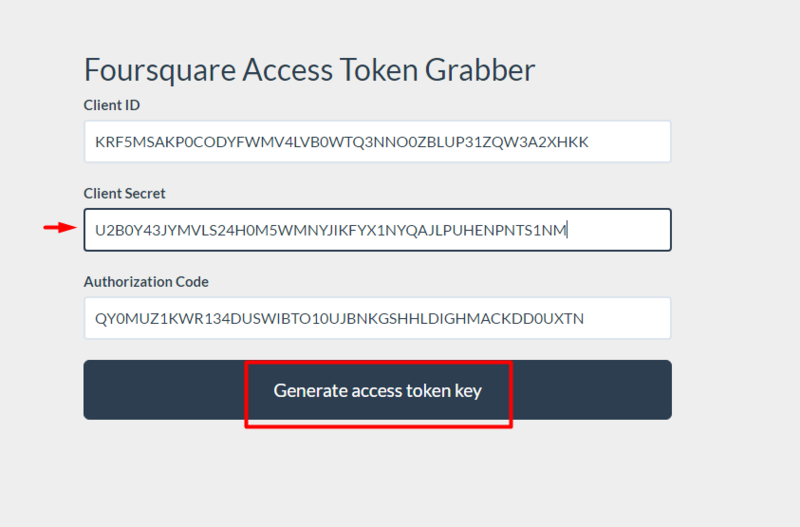 Go to http://tools.creoworx.com/foursquare/ and paste your Client ID at the Key Generator field and press Generate access token key button. 4. Your Client ID and Authorization Code will generate automatically. You should copy paste only your Client Secret (copy the secret from your App Dashboard page – step 2). 5. Copy/paste the key at Hello Followers settings menu field. Text below number – write the text you want to be visible under your Foursquare Followers Counter number. The default text is Friends. The text can be customized in any language. Manual user value of followers – at this field you can set manually number of followers that will be displayed under Foursquare Followers Counter icon. If that option is active (there is number set at the field), that number will not increase, until the real fans number is less than the manual set number. When the real followers number become more than the manual set number, the Followers counter will start count the real Friends/Add. At this part of the settings you can personalize the colors for each button separately at the Followers counter. At this part of the settings you can set the colors for your Followers counter. You can change the color of the buttons background, the hover color for the background. Also you can personalize the color of the icon and text and set different color for them on hover. At the Layout Builder section you can prepare different layouts for your Followers counters. You can create and manage up to five layouts and use it for as much as you want followers counters on one site. Choose the size for all the network buttons you have activated. The size is changing by choosing how many blocks from the Followers counter grid you wish to be filled by each button. Layouts can be set as Followers Counter template at Shortcode Generator or widget settings – depends on the method you will use to display the Followers counter. 2. If you prefer to display the Followers counter with widget, add the Followers counter widget to the sidebar area you want and under Visual setup section of the widget find the option Columns/Layouts. Use the first if you need to display with that code single Followers Counter at particular page. Use the second one if you want to implement the code at the template file of your theme. Compare report section provides the opportunity to compare statistic information for the new fans about two time periods on your choice. The first part of the report present the information as a chart. Here the compare is based only on time parameter, so it is recommended to choose one network only to observe the movement of the fans counter. If you choose two or more networks the chart will present their summed fans count for the period you have set. The second part of the compare report present in table structure the new likes/follows by day for the observed periods. Here the presentation makes possible to compare more than one social network for two time periods. 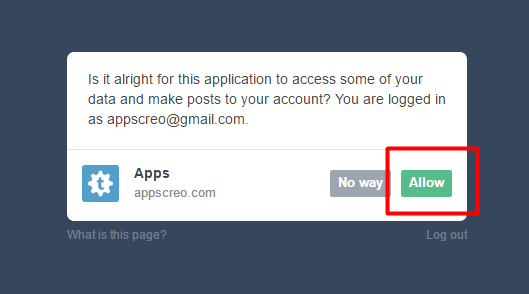 Set the period and the social network/networks you want to receive report and press apply button. If no period is set, the report will be for the last 30 days. If no social network is chosen, the statistic data will be for all the networks active on your Social Fans Counter. The chart below will present the fans number changes according the time period and social networks you have set above. The table include statistic data for all the networks marked at the beginning of the Detailed report section. If no networks are marked, the report will include results for all the networks activated at the Social Fans Counter. Choose social network profile you wish to see report for. The list with the networks will be the same as the networks activated on your Hello Followers Counter. When you click on any network, you will see chart report of the new followers for that network for the last 30 days. The second part of the profile report is new followers statistic information by different time periods – year, month, day by day, by days of week. The first block with statistic data shows the followers counter number for each network active on your Hello Followers Counter. Under that number is shown how many from these users are new. At the upper right corner you can see for which social network you have collected most followers for the last month. Profile Analytics threats as new the users that have been liked/followed your social profiles at the last mount. The statistic period is set to be 30 days back from each day. This chart shows the changes at the new followers total count number for the last 30 days visual. So it is easy to monitor your users reactions day by day and compare them with the admin activity on your WordPress installation. Social Profile Analytics provides some extended social statistics information related with the social followers feature of the Hello Followers add-on. Social Profile Analytics collects statistic information only for social profiles that have been activated at Followers Counter with Hello Followers add-on. The only option you need to pay attention to make your Social Profile Analytics work proper is the Update period. The update data period have to be 1 day or less, otherwise the Social Profile Analytics will not provide actual information.